Thirty-one years may not seem like such a long time in the life of a human being, a tree or a folk song. But in the fickle world of modern music, where pop stars shy of their 21st birthdays often see their careers dumped into oldies bins, thirty-one years is a very long time. 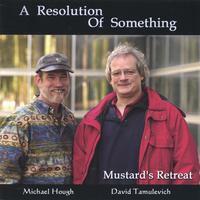 So as David Tamulevich and Michael Hough celebrate their 31st Anniversary as Mustard's Retreat, the same question seemed to burn among aspiring young performers and road-weary old folkies - why you guys? In searching for the answer, one word comes up again and again, the simple word "audience." Everything Mustard's Retreat does on a stage is aimed at pleasing, moving and engaging their audience. Whether singing their own gentle love songs and vivid ballads, telling tall tales or offering treasures from America's vast traditional song bag, a Mustard's Retreat show always feels like it's designed for the people who have come to see them that day, in that coffeehouse, school, concert hall or festival. Audiences sense this from the moment David and Michael hit the stage, are drawn to it like hungry kids to Sunday supper and reward it the best way they know how. They come to see Mustard's Retreat again and again. And again. Spike Barkin, who produces the prestigious Roots of American music Festival at New York City's Lincoln Center, wrote to thank them for their "folk from the heart," going on to say it seemed like David and Michael "take your living room on the road with you and invite people in as friends." David Siglin, of Ann Arbor's legendary Ark Coffeehouse, where Mustard's Retreat played their first songs together, said, "In order to last there has to be more than just talent - you have to enjoy playing, enjoy audiences and enjoy being in front of them. Audiences go to your shows because they know they will be entertained." Margie Rosenkranz, manager of the stalwart Eighth Step Coffeehouse in Albany, NY, said a Mustard's Retreat show "reminds us why we're doing this, pulls people together," adding that the duo transcends the vagaries of passing trends because they remain so "in tune with the audience." "As much as we aim to entertain, we also look to educate," David Tamulevich said of the way Mustard's Retreat approaches audiences, "and hopefully enlighten and open some doors they maybe hadn't seen before. And ideally, to create a moment of community where everybody is sharing the same experience, the same idea, the same song. I mean, that's the only reason for me to be up there: we really want that connection to people." I bought this cd after hearing just one track - Solitary Beach - on FolkAlley. And I don't regret it : it's the kind of well-balanced music I can listen to all evening.